2 Awesome Shadora Promos: Win a 2ct Diamond Bracelet & $1.00 Stud Earrings w/ $7.99 Purchase! Shadora is running two awesome promos right now! 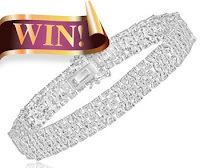 First, they are having an amazing giveaway where you could win a 2 carat genuine diamond tennis bracelet....ARV: $1,199.98!! It's a one-time entry, and entering couldn't be easier...all you have to do is enter your name and email address, that's it! Contest ends 11/30/11. 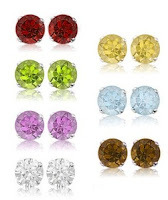 To celebrate Shadora's 1-year anniversary, they are offering your choice of gemstone stud earrings for only $1.00 with any purchase of $7.99 or more! These earrings are made of sterling silver and have a retail price of $24.99...combine that with free shipping on ALL orders, this is a great deal! There is a limit of two earrings per order, and supplies are limited. If you want to make sure you get your favorite gemstone, I'd hurry!